Prepping for NaNoWriMo: The Sequence and Beat Sheet! I love my beat sheet. Love, love, love it. It’s basically a form of outline for a story, but because of my screenwriting background, I tend to think of stories in sequences, scenes, beats, etc. Anna gets a horse for her birthday. Yay. Anna’s father loses his job. Boo. Parents can’t afford to keep the horse. Extra Boo. Anna gets a job at the stables to support her horse-riding. Yay! Anna falls from a loft and breaks her leg. Boo. SEQUENCES are generally used in screenwriting (a sequence equals about 8-15 minutes of screentime), but I’ve discovered they work just as effectively for novels. Sequences are a series of scenes that act as a kind of mini-movie. They have a set up and pay off and end in a change in status quo. Large “reversals” and “reveals” can happen at the end of a sequence. Sequences help to break a story down into manageable “chunks.” In novels, those chunks usually turn into chapters, although you don’t really have to worry about that just yet. Beats are the smaller steps inside each sequence that get you from the beginning and end. When writing out my sequences and beats, the first thing I think about is how the “status quo” is going to change at the end of the sequence, then I write out the beats it will take to get there. Here’s my real live process for the first sequence of Intergalactic (the YA Sci Fi story I’m writing for NaNoWriMo). I knew IdoLL was about to set off on her intergalactic tour and that (at 17), her music career was already waning. I wanted to demonstrate that her manager has been cutting corners financially. At the end of the first sequence, I wanted to have a “Houston, we have a problem” status quo change and a reveal that her manager has not exactly been up front with her. Within this one scene I’ve created the set-up for the story and the current status quo: IdoLL’s fame is waning and her manager doesn’t care about her any more. Because the status quo is clear, the final humiliation at the end of the sequence makes us empathize with her. Her manager and her parents HAVE abandoned her, the gig totally stinks, and her obnoxious rival is the star of the weekend. All her fears have manifested, and it’s only the first stop on her tour. Does this sound like a lot of work? It can be. But when I’m writing the story next month, I’m going to be SO glad I have my beat sheet to follow. Even if there are some blank spaces and vague ideas. I can always fill them in when I get to that sequence. 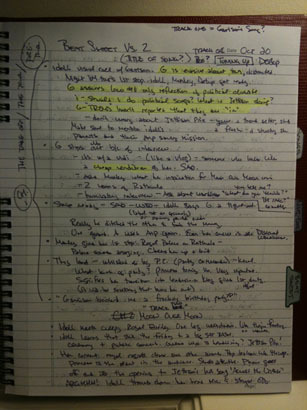 As well, I usually rewrite my beat sheet after the first draft to assist with the rewrite.